The chapel is located in an old country church, complete with hardwood floors and wooden pews. The quaint chapel is decorated in flowers of the season, with a matching bouquet to use for the service or photos. A studio in town (one of our benefactors) donates several beautiful 5x7 color prints as a wedding gift to each couple married in the Little Bell Chapel. There are dressing rooms and a recorded music background. You can bring your own tunes on a CD or cassette and we will work it into the service. Reality Check Wedding: Available Monday through Fridays (excluding holidays) from 8:30 am to 4:00 pm (even open during lunch hours). While you are getting your license ($55), we will meet you at the Courthouse. The service is performed in Harrison at the Boone County Courthouse, surrounding square or in the Gazebo (pictured). The charge is a minimum of $45.00 + a $55.00 license fee = $100.00 total. (free parking, no blood test or waiting period necessary). Be sure to call for an appointment - 870-743-2355. Kick It Up A Notch Wedding: Kick it up a notch from the Reality Check wedding. Available Monday through Fridays (excluding holidays) from 8:30 am to 4:00 pm (even open during lunch hours). 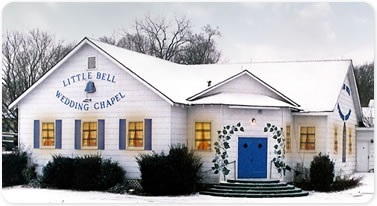 Weddings are held in the Little Bell chapel (NON-candlelight service). The charge is $75.00 plus your license fee of $55.00 = $130.00 total. Kick It Up A Notch includes: flowers, photos, climate control, music, dressing rooms, tailored vows, church ambiance, and free parking. Please call for an appointment - 870-743-2355. Candlelight and Full Service Wedding: We love to do full service weddings. These weddings include services for up to 100 people including best men, bridesmaids, flower girls, etc. You will also receive flowers, photos, climate control, music, dressing rooms, tailored vows, church ambiance, and free parking, PLUS they can include receptions or wedding parties (informal finger foods, cake and hors d'oeuvres). 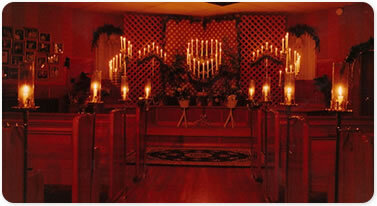 Candlelight services or full service weddings are usually performed only on weekends. For dispensations, unusual requests, and pricing on full service or candlelight services please call 870-743-2355. Prices vary per wedding. Reaffirmations: Tell your spouse that you love them, again and again. We at the chapel are celebrating too...over 30 years of love stories. To share in the success story we offer any alumni of the chapel their first tune-up for free. Whether it be 20th, 10th, 7th, or 2nd anniversary, we want you to reaffirm your vows with us! Many local lodgings are offering reaffirmation specials also, so check around. Tell them you got married at the Little Bell. Off Site Services: Yes, we can travel and do weddings in other churches, chapels, homes, and several special outdoor locations. Just ask for details! You must be 18, and have a driver's license for ID. In the past a fishing license worked in a pinch. There is no blood test or waiting period. The Boone County Courthouse (Harrison) is open from 8:30 - 4:00 pm, Monday through Friday, excluding holidays. The license is $55.00 cash U.S. dollars. In Carroll, Marion and Newton counties, the license fee is $60.00. For after - hours or weekend licensing, contact Little Bell Chapel : 870-743-2355. 1. Reservations made with or without credit cards are financially NON cancellable. We can move dates when available or even postpone for up to 6 months. If we can fill your canceled slot with another similar-sized wedding, there is no cost or loss to you. 2. Our website for Little Bell Chapel contains links to other vendors. While past performances have been excellent, we can not be held responsible for negative situations that could occur.